Kaye Lundgren, in front of the Arkansas Studies Institute, where she works as an archival assistant. As an Arkansas native of 28 years, Kaye knows the value of public transit and the role it plays in helping Little Rock thrive. 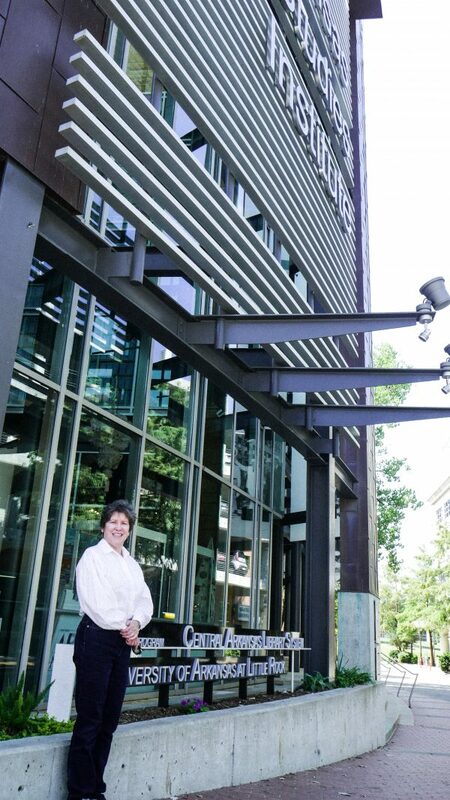 Kaye works for UA – Little Rock as an archival assistant at the Center for Arkansas History and Culture. She has seen central Arkansas grow into the sprawling metro it is today and has remained a supporter of our public transit system ever since. Growing up in Minneapolis and having lived in cities like Boston; Washington, D.C.; and London, Kaye recounts learning to use public transit as a child. She has since carried her knowledge into adulthood. She loves that she can hop on Rock Region METRO anywhere in the city, know where she needs to go and what steps she needs to take in order to get there. She says the greatest thing about public transit is the freedom it allows her. “There are other options besides driving a car. My back isn’t against the wall when it comes to my transportation options. Kaye is a resident in Midtown and loves to ride Route 8 Rodney Parham. She says her favorite way to use public transit is for work. We love this city and we love our riders! Let us know who you are by reaching out at info@rrmetro.org.